Emperor Claudius II banned marriage because he believed married men would make for bad soldiers. Valentine broke these rules and arranged marriages in secret and was eventually thrown into jail. There, he fell in love with the jailer’s daughter, and when he was executed on 14 February he sent her a love letter signed ‘from your Valentine’. Although we do not know their marital status, only men with obstructive sleep apnoea (OSA) were enrolled into the study from Luke Rowsell and colleagues (see page 177), a trial investigating the effect of acute morphine on OSA. Administering 40 mg of controlled-release oral morphine did not increase sleep time with oxygen saturation below 90% (primary outcome), but a lower baseline CO2 ventilatory response was associated with a greater sleep time below 90%. In addition, like love, there was variation in response to the same stimulus, which in this study was related to the OPRM1 genotype. As Ovid first described, Cupid has two kinds of arrow, one of gold that fills the victim with uncontrollable desire and one of lead that fills one with aversion and the desire to escape. It seems that Cupid’s golden arrow struck the medical ward with a desire to measure transcutaneous oxygen, whereas poor old CO2 was left feeling the lead! However, may that be about to change? In this issue of Thorax (see page 157), Conway and colleagues undertake a Herculean systematic review and meta-analysis of transcutaneous CO2 monitoring (TcCO2). They describe 7021 paired samples from 2817 patients in 73 studies and found considerable differences between TcCO2 and partial pressure of carbon dioxide (PaCO2).The major source of inconsistency was location and temperature of the sensor. So it seems that Cupid will need to change the accuracy and precision of his golden arrow if he is to change the current practice for measuring blood gases. St Valentine is well recognised as a third-century Roman saint, commemorated on 14 February and associated with courtly love. However, whether St Valentine was indeed a single individual or a pseudonym for several remains unknown. And so it is for idiopathic pulmonary fibrosis (IPF): whether it is a single disease entity or an amalgamation of a number of molecular defects remains to be determined. In this issue of Thorax (see page 132), McDonough and colleagues used publicly available data from GEO data sets linked to miRNA expression from patients with IPF. They identified 16 modules in IPF, of which 9 correlated with lung function and 1 with survival. While it is to early to say that these reflect different endotypes of IPF, it does add fuel to the fire that IPF is not a single pathological entity. Perhaps St Valentine’s will be the day that precision medicine falls in love with IPF? Billy Ray Cyrus sang about his ‘achy breaky heart’ and indeed indicated it ‘might blow up’. On Valentine’s Day, people who have been unlucky in love will be said to suffer from a ‘broken heart’. If the problem is on the right side of the heart, this may well be at a pressure where it could blow up and be broken. This could have been the inspiration for Benjamin Garfield and colleagues (see page 164), who investigated the association between growth/differentiation factor 15 (GDF-15), a prognostic marker in pulmonary arterial hypertension (PAH), and skeletal muscle wasting in PAH rat and mouse models and in humans with the disease. Circulating GDF-15 levels correlated with tibialis anterior muscle fibre diameter in the rat with GDF-15 levels, predicting those patients with PAH with preserved muscle strength. GDF-15 stimulated an increase in phosphorylation of transforming growth factor beta-activated kinase 1 (TAK-1), which when antagonised increased tibialis anterior muscle fibre diameter. As discussed in the accompanying editorial (see page 103), GDF-15 is a biomarker for PAH and TAK-1 inhibition may be a target to prevent muscle wasting in PAH. We must tell Billy Ray Cyrus the good news. Love is traditionally localised to the heart—an organ that, while in the thorax, does not feature in this journal as frequently as the lungs. Primary ciliary dyskinesia (PCD) is frequently associated with dextrocardia and situs inversus. In this month’s journal we give the heart some coverage, through a brief communication from Best and colleagues (see page 203). In a retrospective study of 389 individuals with PCD, they found that just over half had some form of situs inversus. Parental consanguinity was associated with situs inversus. In contrast, the presence of biallelic mutations in one of nine PCD genes was associated with a normal situs—a heart in the right place. A relic of St Valentine (which may or may not include his pelvis) is located in St Anton’s Church in Madrid. 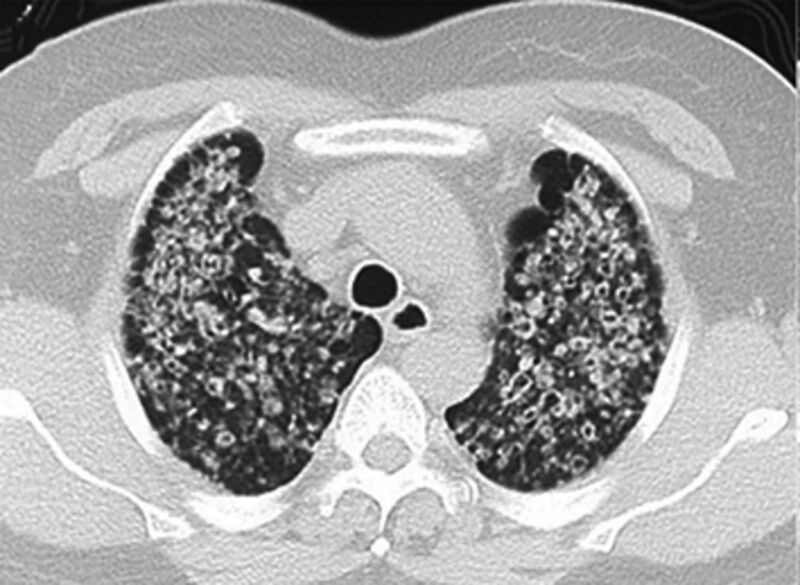 This month’s image describes an unusual cause of pulmonary nodules—think of the pelvis! (see page 208).